Caffè del Doge Nero is a Venetian espresso coffee with a lot of flavor and richness. The blend consists of Arabica beans from Central America and the Caribbean with a base of Arabica beans from the Alta Mogiana region in Brazil. When they have cooled down after roasting these beans are mixed with washed Kaapi Royal Robusta from India. 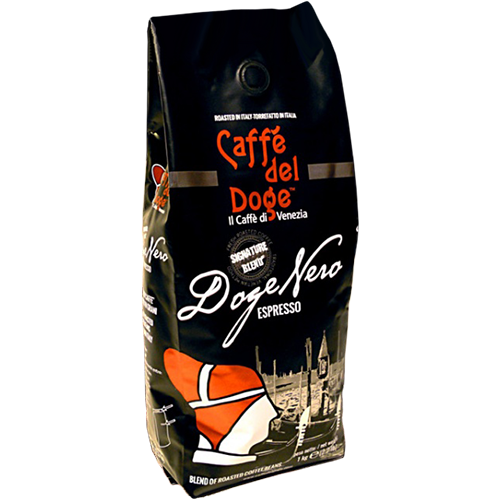 Doge Nero comes from Caffè del Doge's roastery in Venice in northern Italy. This is a lovely coffee with lots of character and richness. The roastmaster has worked up a magic espresso blend for those who love a creamy espresso with hints of chocolate and nuts. The coffe delivers a long finish with a soft bitterness. This mixture is enjoyable as an espresso but is also perfect with hot milk. This coffee is for those who are picky and loves the Italian espresso.